An 18 year old KKF poses with a really pretentious sunbather on Waikiki beach (I think) on the Big Island. 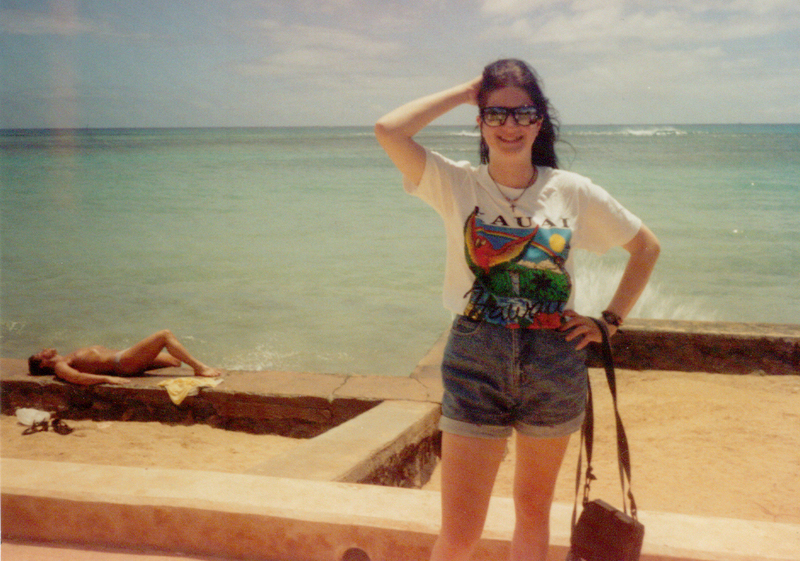 When I was 18 I visited Hawaii with my mom. It was my first plane flight and, other than a weeklong trip to Ohio when I was a pre-teen, my first actual vacation. Our friend Emmette graciously gave us a grand tour of Kauai, the island he lives on. Part of this tour was the obligatory luau. I was completely grossed out by the idea of the hog being buried in the ground. They expected us to eat that? Really? Ugh, no way! So I had a mai tai. (Somebody told me it was the real deal but I disagree.) That made no difference. I was still horrified. But when they raised up that pig and started plating up, the aroma drew me in. Maybe it wasn’t so disgusting. With the first bite, it was a wrap. I was in hog heaven for real. 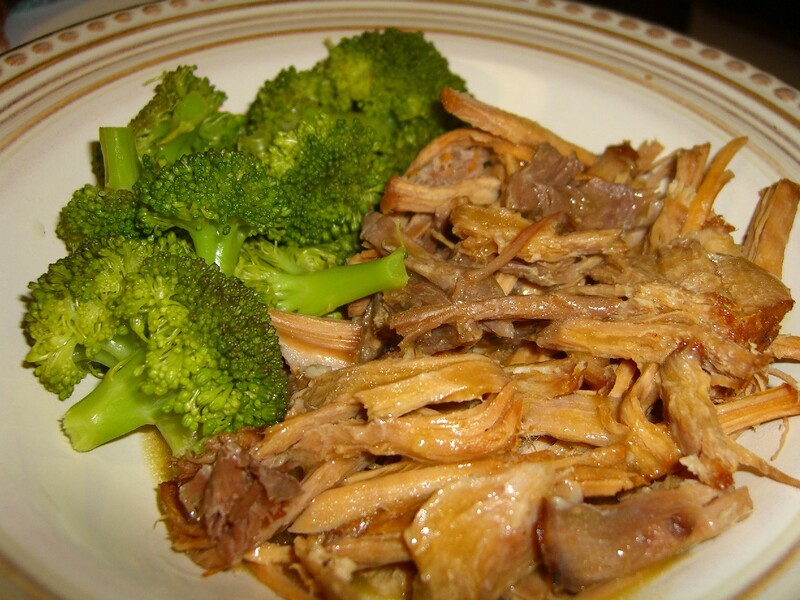 When I came across this recipe for kalua pig in the crockpot I was intrigued. Could this really duplicate that experience? It was worth a shot. I had to special order the Hawaiian sea salt because I couldn’t find it at Whole Foods (what gives??) but it was worth the wait. I used a 2 pound pork roast from Nature’s Harmony and about a 2.7 pound ham roast from Stokes Family farm. (What is the difference? Not sure.) I poked the meat with a knife and rubbed in about two tablespoons of the sea salt, put it in the crock and poured 1 1/2 tablespoons of liquid smoke over it. That’s it. Lidded it and let it go for about 8 1/2 hours. I did turn the meat about half way through the cook time. And all day long I had to sit and work and SMELL that roasting away. I thought I would die waiting! Finally the time came. A sample, of course, was a given as I removed the meat. Man, oh man…I almost passed out right there. It was sweet without being sweet, savory and hot and melting in my mouth. And oh, the FAT. The fat was soft, moist edible love. I actually rubbed fat into the pork after I shredded it, it was so freaking delicious. I put it in a warm oven to keep it hot while I made some gravy out of the drippings: Strain drippings, whisk together water and AP flour (or arrowroot flour – I wonder if you could use coconut flour?) and whisk into the drippings. Taste. It may be very salty depending on how much sea salt you ended up using. I’m glad I used more than the recipe called for because I ended up with a good amount of gravy by adding more water. It was still VERY flavorful. I kept the consistency a bit thin because I didn’t want it to compete with the pork, just compliment and add moisture. Let me tell you…it was out of this world. I served it with CSA broccoli and poured the gravy over that, too. I was satisfied with a relatively small portion, too. Even test subject Bill was quite impressed and agreed it was a keeper. If I’d had a hula skirt, I would have put it on. This pork, while not Hawaiian luau, is as close as you’re going to get on the mainland. to the gravy. Love that thing. I packaged up two containers of kalua pig and poured gravy over them, and into the freezer they went. I really really hope they thaw well! Follow up: they thawed to perfection the way I packed them up. Excellent!